A couple of weeks ago I posted a hack that enables assigning a workflow task to a related user on the triggering object. This works with a class called WorkflowInstructions that parses a task descriptions and looks for a familiar string format (a "workflow instruction"). Once a workflow instruction is found, the class processes the workflow task according to the instructions. Since the code allows processing of several types of workflow instructions, here is another useful use case... setting activity cto a certain number of business days from the case create date. For some reason, business hours is available in apex, but not when setting workflow tasks. Add a business hours variable to hold your selected business hours record. add 'businesstime' when checking for workflow instructions. 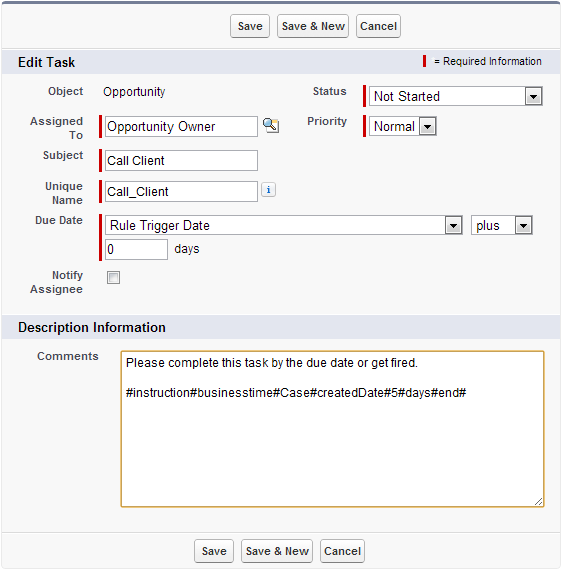 add a method that processes the 'businesstime' workflow instruction.